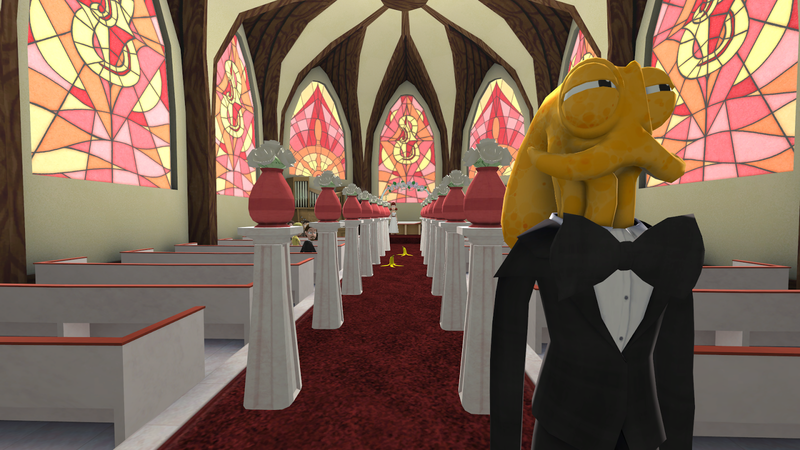 The game opens with Octodad's wedding to Scarlett, a beautiful reporter, seemingly oblivious to Octodad's not-so-hidden secret. 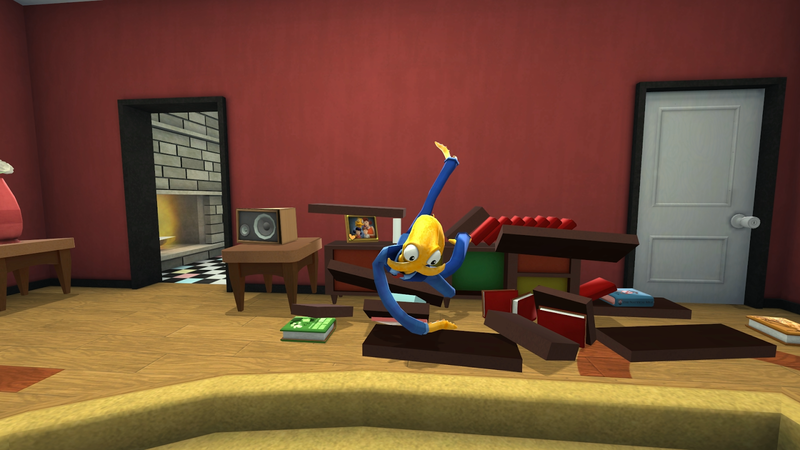 This is where you discover what makes Octodad so utterly unique: the control scheme. You use the two analogue sticks to control one of Octodad's arms, with one controlling up, down, left and right movement, and the other controlling forward and backwards movement. To then control his legs, you either hold the left or right trigger, depending on which leg you want to move, and use the analogue sticks in the same way you did for the arm. Simple, sort of. It does take some getting used to, but that's literally half the fun of the game. Watching someone play for the first time is always hilarious, especially when they have no expectations or knowledge of the game. The game takes place in a variety of locations, such as Octodad's house, the supermarket and the aquarium, and each one has a handful of objectives for you to complete. These can literally be anything, it's impossible to predict. At the store, you'll have to collect all of your shopping from the shelves. At home, you make coffee and pour some chocolate milk for your daughter, Stacey. At the aquarium, you can play fun (yet educational) games. To complete these tasks, you pick up and interact with items, which all have realistic physics. You'll often be surrounded by items that you can pick up, which will undoubtedly end up all over the level as you throw and kick them around, often unintentionally. It isn't just about completing tasks though, there is an ongoing story. As Octodad can't talk, you pick up the story from what others say, and it seems that Octodad's marriage to Scarlett is in trouble. She's concerned with Octodad's quietness and weird behaviour, which can all be explained with the fact that he's a freaking octopus, but she doesn't know that. Somebody does know though, and it just so happens that he's an evil chef. He constantly harasses Octodad and his family, desperate to reveal the truth and maybe cook up some calamari. It's a fairly interesting story, and is full of great humour. The soundtrack is almost like elevator music, and it definitely adds to the charm of the game. Visually, it looks great. Everything has a sort of matte finish, much like a Portal game, so all of the environments, characters and objects look perfectly new and smooth, giving Octodad: Dadliest Catch a highly polished look. So that's Octodad, a bizarre, physics based game with no real genre, and it's one of the most unique and unforgettable indie games ever released. Wonderful characters and ridiculous controls will ensure that this game sticks with you a long time. The only drawback is that the game is only a few hours long. Slightly longer if you're a completionist, but not by much. A sandbox mode, similar to the recent Goat Simulator would be perfect for Octodad. A huge open world with a ton of secrets and unlockables would literally be the best thing ever (if anyone from Young Horses, Inc. is reading this, go on, add a sandbox mode to the PS4!). If you're a fan of indie games, you'll probably already have played it, but for everyone else who has yet to experience one of the weirdest games of all time, what are you waiting for?